Strong infrastructural and industrial development will fuel the industry growth over the forecast timeline. Increasing environmental concerns and stringent regulation norms regarding air treatment and disposal are expected to further support the industry demand. Polluted air mixed with chemicals and suspended matters need to be filtered before it is released into the atmosphere. Moreover, operating efficient production facilities across numerous industrial applications requires the use of industrial air filters for improving the air quality at lower costs thus enabling higher production volumes. Growing industries including cement, power generation, chemicals and metal processing may discharge a huge amount of air pollutants. Global cement demand is increased by 6.7% from 2009 to 2016. This growth is attributed to growing need for infrastructure development. Asia Pacific region accounted for highest demand of over 4,000 million metric tons in 2017 followed by Middle East & Africa. Strict industrial safety regulations defining the air quality inside industrial and commercial facilities have resulted into industrial air filtration market growth. Growing concern pertaining to harmful impacts of air pollutants found in industrial workplaces should catalyze demand for the industry size. Environmental awareness and rapid industrialization coupled with resource scarcity is also expected to catalyse industrial air filtration unit demand. Development of innovative raw materials and small fibres offering higher degree of filtration should cater industry demand. High capital investment and operational cost will hamper the air filtration market over future period. Contaminated air filtration required additional equipment which will add the capital expenditure resulting expensive overall operating system in terms of maintenance cost and energy consumption. Dust collectors market size is expected to grow over 7.5% over the forecast timeframe. It helps in increasing the equipment life by recirculating the clean air within the workplace leading to reduced energy costs. It provides cleanliness at workplace, improving productivity by reducing downtime, and having healthy workplace, will further support industrial air filtration market demand. HEPA filters market demand is expected to register over USD 1.7 billion by 2024. These are widely adopted in the healthcare sector owing to environmental sterility, reducing disease and improving patient’s health. Rapid urbanization accompanied with strict government mandates regarding air quality check has necessitated product installation in residential and commercial places, which in turn will drive the market size. Baghouse filters market may register gains at over 6.5% owing to its wide usage in food & beverage and cement industries. Rise in environmental regulations such as NESHAP is compelling cement industry companies to comply with stringent measures for emission control, further fueling product demand. Industrial air filtration market size from cement applications is poised to exceed USD 900 million by the end of 2024. Increase in filtration solutions demand during cement mills debusting may favour product demand. Rising infrastructural development projects along with cement producers are focusing towards product development accompanied with strict government standards is likely to stimulate industry growth. Industry demand from metal working application may register gains close to 7.5% during the forecast timeframe. Increasing demand for the waste purification and usage of energy-efficient systems will save energy cost thus supporting the product demand. Reduction in operating costs, worker safety, and meeting environmental requirements will drive industry growth. 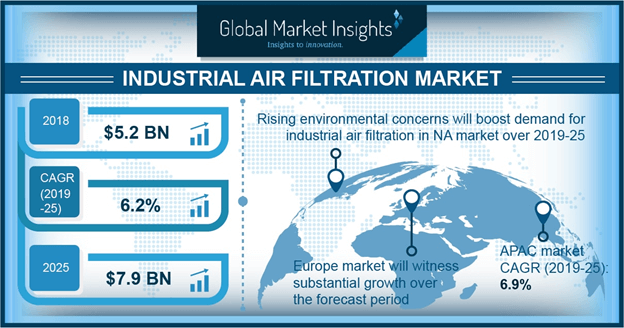 Industrial air filtration market demand from power applications may surpass USD 1.2 billion by the end of projected timeframe. Coal, oil fields, and minerals mining industries may support the overall demand along with rising investments in the renewable energy and fossil fuels is driving the power sector, thereby propelling the industry growth. 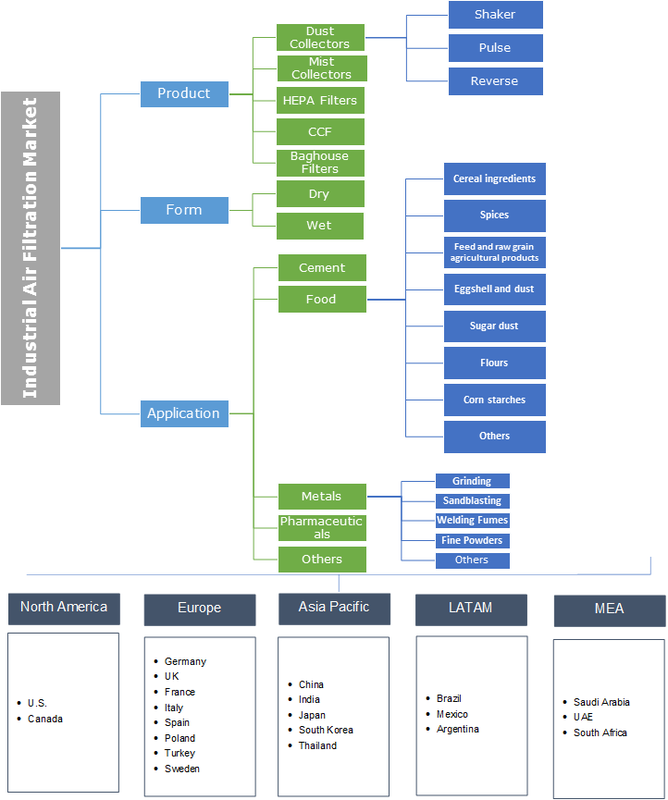 North America driven by Canada and the U.S. industrial air filtration market size is expected to reach at over USD 1.5 billion up to 2024 owing to rise in pharmaceutical and food industries. Stringent regulatory regimes pertaining towards safe working environment for workers from harmful emissions and particulate impurities should strengthen regional demand. Europe market size, led by Germany, UK, France, Italy and Spain may witness significant gains at over 6.5% by 2024. Increasing demand for energy-efficient filtration systems will support regional market demand. Furthermore, directives issued on industrial emissions set out permission limits and control of installations of pollution counter measures. Industrial air filtration market share is competitive and consolidated with major industry players include AAF, Absolent Group, Andrew Industries, BWF Protec, Camfil Group and Cummins, Inc which provide to local and international market. Many industrial participants are focusing on quality and product differentiation as a part of marketing strategy. These strategies play an important role in expanding product portfolio among different companies. Industry participants have high degree of technical expertise, strong global presence, as well as a well-established customer base. Air filters are those filtration systems used in various industries to filter the indoor as well as outdoor air. Air filters consist of filters, which remove the hazardous particulate such as dust, mist, fumes, and carbon matter from the air, maintaining the air quality at workplaces and creating an environment-friendly atmosphere. Industrial air filtration is segmented by product, by application, and by region. The increasing sales in chemicals is attributed to increasing demand in its supplying segment such as plastic & rubber, clothing, construction and energy. This growth in pharmaceutical, cement, construction and chemical industries will boost the demand for industrial air filtration products as these play a crucial role in production of these industries.